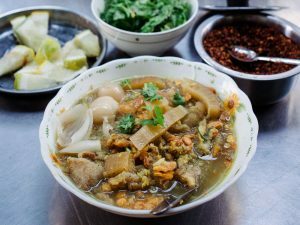 My cousin, Khin Khin Lat, suggested we spend the last couple of days in Rangoon eating our way through the food that we would not have time to cook ourselves. Being located down town there were no shortage of choices. Breakfast started fairly early; the best time of day when it was still cool enough to explore the numerous food stalls. We headed towards the Indian quarter as I wanted Christopher to try pea pyote and palata, our first of many breakfasts that day. We sat outside sipping sweet milky tea while watching the palata being made. There were three men in the tiny kitchen that opened out onto the street. 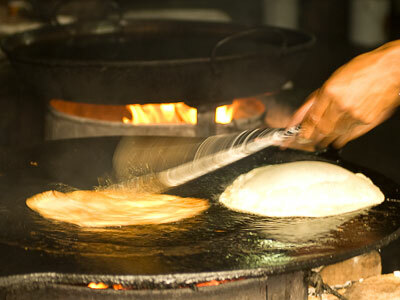 One to stretch and fold the palata, the other to fry and the third to assemble the dish before it arrived on our table. I was particularly interested to see how the layers were created as there are several methods which I explain below. The palata were cut into quarters and served with a large spoonful of sweet pe pyote. Sieve flour into a mixing bowl. Add salt, sugar and butter. Rub butter until it resembles bread crumbs. Make a well in the middle, add egg and milk. Then gradually add water while mixing with hand until it comes together to a sticky dough. Turn out onto a well-oiled non-stick work surface and knead for 10 minutes. You will find the dough gradually becoming soft and elastic. When you are ready to use, (if using from the fridge, take out well in advance so the dough is at room temperature) grease the work surface and hands with oil. Take a dough ball and with a palm press down to flatten then stretch into a circular shape. The important thing here to make sure the dough is as thin as can be, almost see through. Brush oil over the dough. Simplest is to fold two ends over so it becomes an elongated shape. Fold over opposite sides to create a square. This will not create many layers. Similar to Chinese pancakes, cut from the centre of the circle to the other edge. Take one edge and roll around the circle to form a cone. Put the cone upright and press down with palm to create a disc again. 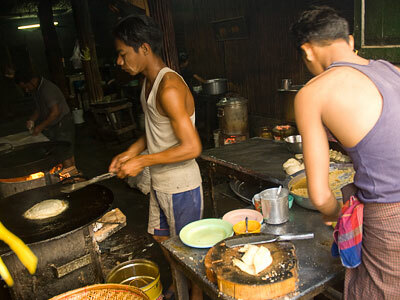 I’ve seen this third method in Burma as well as the Roti makers in Malaysia. Fold two sides of the circle inward to create an rough rectangle. Pick up both ends of the length, stretch to form a long rope and wind into a ball. Flatten the dough again into a disc with the palm. Once the folding is done, cover with a damp cloth so that a skin does not form on the surface. Heat a generous amount of oil in a non-stick frying fan. On moderate heat fry one at a time until golden brown, flip and cook the other side. Serve while they are hot with sweet pea paste. For a savoury version, reduce the amount of sugar and serve with a curry or lentil dhal. Really appreciate all the authentic recipes you’ve posted. 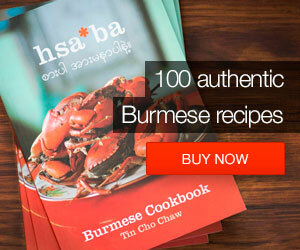 It’s quite difficult to get your hands on Burmese recipes here in Australia. Like you mentioned – there’s only really one restaurant in Sydney (Strathfield). I was wondering if you have a recipe for Pe Pyote? Pe pyote is really easy to do, just need to find the right beans thought I have often used chickpeas as a substitute. Will email you more details. The palata dough needs to be fairly wet…and the kneading will make it elastic and stretchy. Hope that helps. I tried making paratha from your recipe above and had problems stretching/rolling the dough out into a thin circular shape after making the “layers” according to the 3rd method. Do you know what I might be doing wrong? The dough is very resistant after being wound into a ball…perhaps there was not enough water? I left about less than 50mL of the water out of the original dough mixture because I thought it might have made it too sticky/wet. By the way, I made the “slow-cooked duck curry” dish from your recipe, except I used chicken thighs and it turned out exquisite! I had never tasted chicken in curry that’s so tender! I am looking forward to your book coming out in Melbourne and will definitely order it. But why is it not available in Sydney? my mom told me to get beans in the chinese supermarket to make pe-pyoke and they gave me soya beans now Im stuck with big container full of soya beans any suggestion? if you have any ideas. Love your website Ma Cho, really enjoy looking through it. keep up the good work. thanks. Best place to find the right pe is from Indian supermarket… I’ll see if I can find any good soya bean recipes. I would like to have the recipe of Pe Pyote if you dont mind. I have been trying and till now never success yet…… I ordered bean from Burma, but my pe pyote is still not eatable… how good I am. That’s great you’ve managed to get the right beans. It’s been difficult to find and I have been using chickpeas instead. You need to soak the beans overnight and boil them with a little baking soda. I’ll email you with more details. Your book is amazing! I just received the two copies I ordered (one for me and one for my Mum and Dad). My Dad is Burmese (from Rangoon too) and he is going to love his copy! Thanks for all your recipes… great help even though I haven’t tried all of them. I am wondering if I can also get a copy of pae pyot recipe. Thanks again and appreciate your help!!! It’s been a pleasure surfing through your site! Hi, thanks for telling me about this recipe. I have the dough elastic enough (you really do need to knead the dough for at least ten minutes), but I’m still working on the layers. I’ll try all three methods. Mine came out crispy, but it wasn’t flaky and layered. Maybe I squished down on it too much? I saw a video on youtube and they had a fourth way of making layers. They make them similar to the Chinese green onion pancake. They roll it up on itself to get a big tight tube of dough, then they roll it into a snail-like figure and then they tuck in the end. Then, they push it down to about a five inch disk. 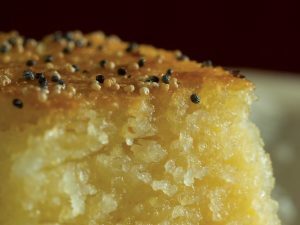 I am unfortunately looking for yet another type of Burmese bread recipe. When I was younger, I had a Burmese Chinese friend who served this Burmese bread with some curry. The bread was smaller than the htad taya and it was very buttery and flaky, almost like a croissant. 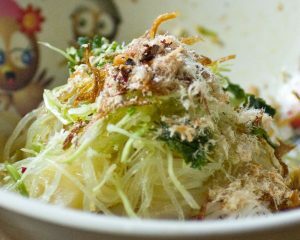 I always that maybe she adapted this from a croissant recipe, but then I was at a Burmese restaurant in San Francisco and encountered it again. Do you know what I’m talking about? Do you have a recipe for that? I suppose it could be a variation on the htad taya, but it is really layered and buttery in a way that the htad taya is not. Hi, The right bean for Pe-Pyoke is VATANA beans from Indian Groceries. They have to be first soaked for about 3 hours, then drain the water and cover with damped cloth for about 2 days until they sprout. Then put in a little bit of jaggery and baking soda and steam them until tender. 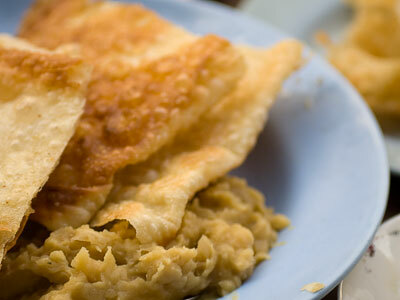 My girlfriend is Burmese and Pe – Pyoke with parathas are my favourite Burmese dish. Shame it’s not in your book. However her mum doesn’t make it as often as i would like (as much as i do ask), can you send me the recipe please? I want to surprise her by making it myself. Also re: the talk about ‘vatana’, alot of people are saying ‘vatana beans’ yet i searched it up and i’d say ‘vatana’ means whole peas. It also happens that my girlfriend’s mum’s pe- pyoke is made from whole green peas.